If you are under 5’4”, I’m sure you already know you are petite and the best practice is to look for petite sizing. Regular sized clothing (also called Misses sizing by some designers or department stores) are made to fit women of average height (5’4 and above), thus will not fit petite sizes properly. Petite clothing stores are made for women under 5’4″ and they are designed differently in order to fit short girls. Now the question is do you really understand petite size chart? How are petite sizes different from regular sizes? First things first, one important clarification is petite does not mean size 0 or skinny. 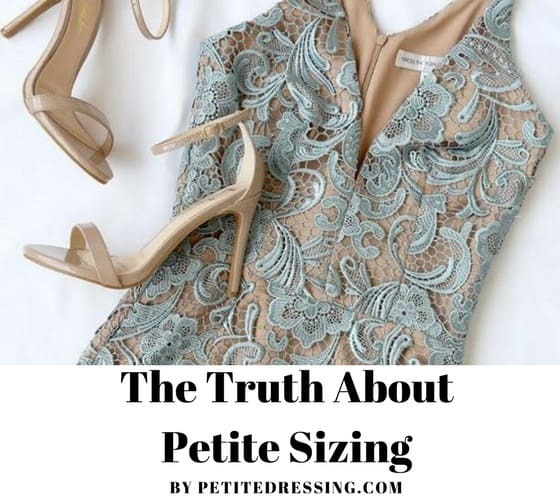 Petite sizing in general is really just referring to the height, and not the weight. Petite women could be skinny or curvy, and could have different petite body type . Regardless the specific body type, petite women under 5’4″ could all use the information below on petite sizing. 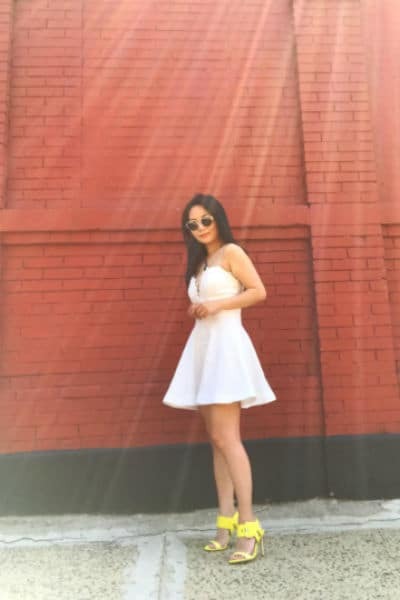 Most petite women have shorter torso, but that is not absolute. How do you know if you have long or short torso? Measure these three distances. First, measure the distance from your lowest rib to the top of your hip bone. Second, measure the distance of knee to ankle, i.e. from your ankle bone up to the side of your leg to knee. Last, you should measure knee to hip, i.e. stand up and measure from the point on your side where your leg lifts from the side of your body to your knee. Is your rib to hip under 2” ? Is the length from knee to ankle is greater than (or equal to) the length of knee to hip? If so, you have short torso. Most petite sizing have taken into account short torso in order to fit petite women better. Since it is hard to alter the torso (body) of a piece of garment, we suggest you pick out the right one from the onset, i.e. shop in petite department. Another issue that may not be as obvious is short torso may make it unflattering or even challenging to wear certain styles. Have you ever noticed some dresses’ straps keep falling off? That is probably because the dress is cut for normal torso women, thus the straps are too long for you. The reason could be your torso is short or your shoulders are narrow, which we will talk about later in this post. The solution is to wear petite dresses with stretchy material thus the shoulders or shoulder straps can adjust according to your body frame. Click on the images to shop the petite dress. Petite women tend to have shorter arms, thus sleeve length should adjust accordingly. The right way to measure your sleeve length is to place one end of the measure tape at the top of the center back, let it run over your should and hang down to your hand. You should measure from your shoulder to just before the wrist bone. Make sure you are bending your elbow when measuring yourself, which is hard to do and you are better off with a friend’s help. Note that this measure is always the full length of your arm. Keep in mind finished pattern measurement for sleeve length will be impacted by the height of sleeve cap, so it is likely that finished sleeve length will be shorter than the body measurement. For American designers, petite sizing sleeve length could be 0.5 to 2.5 inches shorter than regular sizing. Take Banana Republic for example, petite sizing for tops or sweaters has sleeve length ranging from 30” (XSP) to 32” (LP), compared with 30.5 inches (XXS) to 34.5 inches (XL) for regular sizing. On the other hand, the style of the clothing can also affect the sleeve length of your choice. For blazer, jacket or coat, the best advice for petite women is to have your sleeves end right around the wrist, which will give you the best tailored and fitted look. For sweaters or blouses, on the other hand, you have many choices. If you like the look of a cozy and slouch sweater in the winter, then you may prefer sleeves 1 to 1.5 inches longer than your normal sleeve length so that your sleeves may cover half of your palm. If you happen to love a knit top with really long sleeves, then rolling them up could also look good. In the summer or the transitioning weather in the fall, ¾ sleeve is a smart choice, which is a few inches shorter than your usual length. Click on the images to shop the petite sizes. 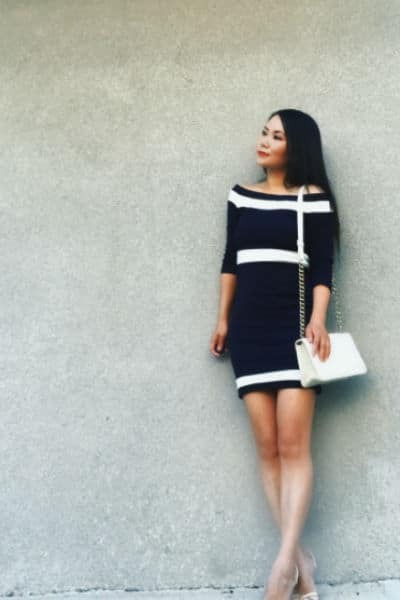 Most petite women have narrower shoulders. 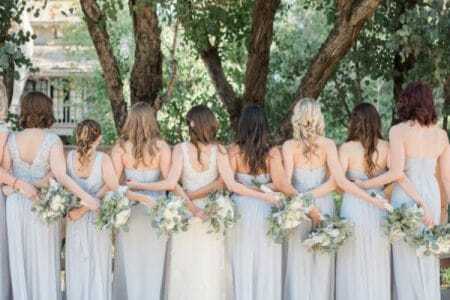 If you want to know your exact shoulder width, you probably need a friend’s help to do this one so that you can stand with your shoulders relaxed. Locate the correct shoulder points and measure across the front of your body. If your shoulder width is under 13.5 inches, you are classified as petite. A well fitted shoulder length will make a whole world of difference for your blazers or coats, and the best way to find the right shoulder width is to shop in petitedepartment. Otherwise it is quite costly to send it to tailor in order to change the construction of shoulder and make it fit your petite frame. For sweaters or blouses, there is many variations of shoulder width you can choose from, depending on the style you like. 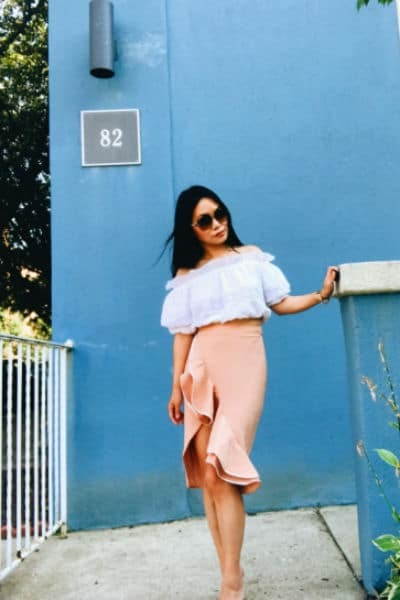 Off the shoulder style or cold shoulder style have been very popular in the past several years, and they seem to have stayed in our wardrobe as a classic staple instead of a short lived fad. They are universally flattering, and they are especially great for petite girls with narrow shoulders. 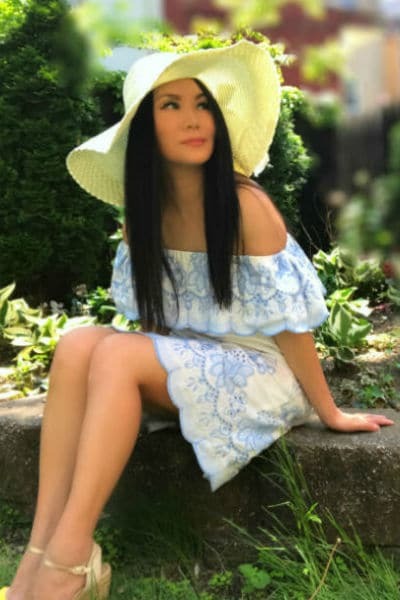 With off the shoulder or cold shoulder style, you do not have to worry if your shoulder width is hitting the right spot. In addition, because these styles show certain amount of skin, they are very flattering for petite women. Inseam is the length of the inner leg, from the top of the thigh to the ankle. 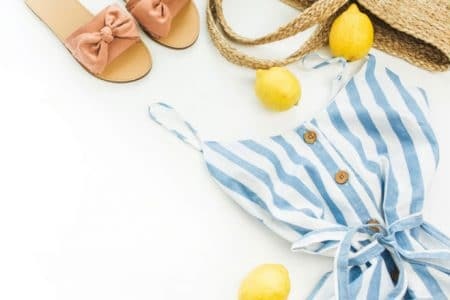 Whether you are looking for petite jeans, petite pants, or petite jumpsuit, the right Inseam length plays a critical role in whether they fit you or not. Most petite women need to wear shorter inseam, but there are also petite girls blessed with longer legs, even though they are under 5’4’’. To find out your exact inseam length, you should pick out an existing pair of pants or jeans that fit you well and take the measurement. You should stretch the tape down the pants till you reach the bottom of the inside of one leg, where it touches the ground. The measurement from the crotch of the pants to the hem is your inseam length. Petite-size pants have inseam up to 2 inches shorter than regular women’s sizes. Now, you might be wondering if your inseam is fixed, just like your bra size. That is only true to a degree, as the answer largely depends on what style of pants you are looking for. Pants have different rises and leg length. In general, high rise or high-waisted style are more flattering to petite women, as they elongate your legs. The rise of the pants, however, should not affect your choice of inseam. Whether you are wearing high rise jeans or low rise jeans, your inseam might be the same. What does affect your inseam is the style of leg length. Are you looking for a full length look or a cropped look? If you are looking to get a pair of tailor pants, it probably makes sense to go with full length, i.e. the hem of your pants might need to be closer to the ground. In that case, you may want to add one inch or so to your regular inseam. On the other hand, if you like the look of cropped pants, then you might even subtract one or half inch of your regular inseam in order for your hem to end right around your ankle. In addition, the height of your heels also matter. If you are mostly wearing high heels, then your inseam could be half inch or one inch longer than when you wear flats. Click below to shop petite jeans inspired by petite celebrities. Finally, it is worth mentioning that defining petite sizing by height under 5’4″ is a common standard in fashion industry, but not absolute. Human body has so many different variations there is many other factors that come into play to make someone appear to be taller or shorter than she actually is. Some women could be over 5’4″ but still find petite sizing pants fit them better, if they have short legs and long torso. There are also petite women well under 5’4″, but are blessed with longer legs and wear inseam of over 30 inches. Petite body types are also important in determining what size you should wear. Petite Dressing categorize 5 petite body types: petite apple, petite pear, petite inverted triangle, petite rectangle and petite hourglass. If you want to know which one you are, take this petite body type quiz to find out. Here is why body type matters in choosing the right petite sizing. 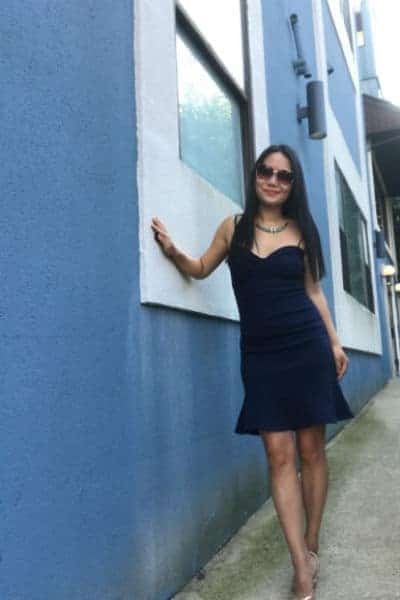 If you happen to be a petite inverted triangle or petite rectangle, you have prominent broad shoulders and athletic build and you may also have long arms. In that case, even though you are under 5’4″ overall, you may find regular size jackets fit your upper body better. You could still possibly find petite pants fit you better, if your inseam is under 30 inches. Shopping in both regular and petite department is your best bet. Needless to say, the best way to find out what size fits you better is to always try on more than one size and compare. You should also know that dressing for your petite body frame is more than just finding the right petite sizes. Too often we hear about petite women complain they cannot find their sizes, and some of them believe if they shop at Ann Taylor petites then problem is solved. Wrong. Just that a dress is labeled petite sizing does not mean it will look good on you as it does on a tall girl. Finding the right petite sizing is just the first step of dressing for your petite frame. 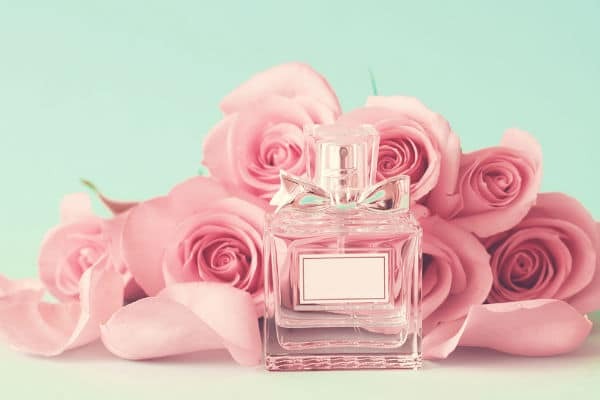 There is so many other factors that determine whether or not your clothes will look good on you, and one of the key petite styling tips is to create better proportion. In addition, the silhouette, fabrics, and colors all matter.